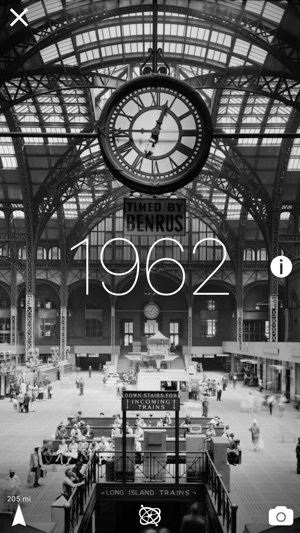 The time travel app for your iPhone. Hold up your phone to see into the history of the city around you. Déjà Vu is a collection of individually-curated vintage photographs that show the city around you as it used to be. Peer into these "wormholes" at a specific place in time and space to see back into another era. Hold up a photograph taken in the spot you’re standing to compare today with the same view in the past. 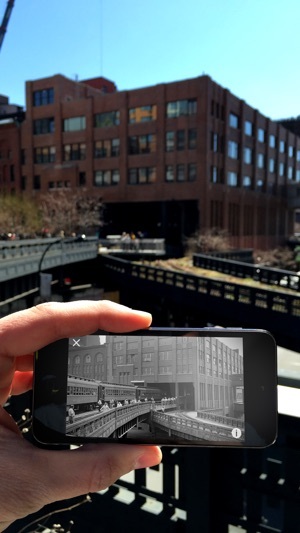 Déjà Vu uses the fusion of your iPhone's sensors to create an augmented reality experience: your phone’s GPS lets you "home in" the spot the photographer stood, and your phone’s gyroscope and compass spin the photo to the angle it was taken, letting you compare the vintage photograph to what stands in its spot today. Use a side-by-side view camera to take a "before and after" photo comparing yesterday and today. Explore cities around the globe, including New York City, Boston, Washington, London, Paris, Jerusalem, New Orleans, Paris, Chicago, Philadelphia, and San Francisco. Let Déjà Vu carry you from one historical site to another in your own city, or travel to cities throughout the world. Whether you're touring New York City or walking to work in Boston, Déjà Vu lets you explore the past around you. Tour the original Penn Station, see the Capitol Dome under construction, or watch Union troops march through Faneuil Hall. Immerse yourself in an expanding collection of vintage photographs across the city. • Compass: Each photo has a specialized compass to guide you to the exact spot the photo was taken so many years ago. 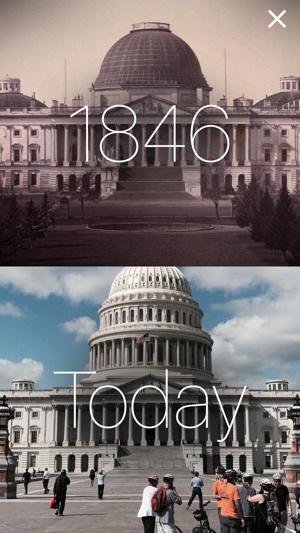 • Gyroscope: Déjà Vu shows you exactly which direction to face to recreate the shot. Tap the gyroscope and the photo will spin to face the correct direction. All you have to do is point in the same direction and tilt your phone until it matches up. • Camera: Once you're pointing in the right spot, use a side-by-side camera view to recreate the shot and take your own "then and now" photo to share and post to social media. • 3D Touch: See quick previews of any photo on the map with Peek and Pop. Get quick access to different views photos around your current location from the home screen by pressing on the Déjà Vu icon. • Point of View: See what's close around with a "point of view" on the landscape of your city. Point your iPhone in a direction and explore. 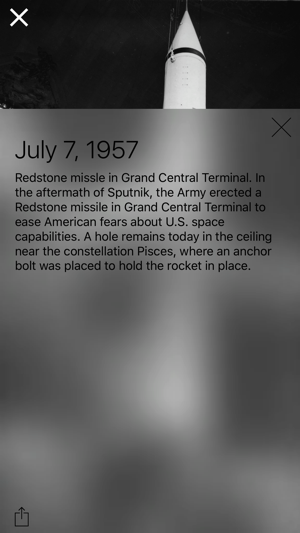 • Filters: Time travel to different eras in city history using the Calendar menu, and choose other locations around the world from the City menu to become a master of space and time. Become a traveler of both time and space with Déjà Vu. You'll connect with the past and future like you never have before. App is crashing when I take a picture! The app crashes when I try and save my picture. We're sorry you encountered a problem. We've fixed a number of issues with the latest release, and added new features like maps as well, so we'd encourage you to take a look at the latest version and let us know if you still have any problems! What a great idea! Finding old photos that correspond to your location is lots of fun - the only drawback is that currently there aren't very many photos in the app's database (and virtually none from the boroughs). Hopefully the designer will continue to add more. Kudos also on the elegant interface (for one thing, it's nice to see a departure from the candy color schemes used in most apps). It's amazing to see pictures of the streets I walk down from a hundred years ago. So much has changed, but the cities are still so familiar. 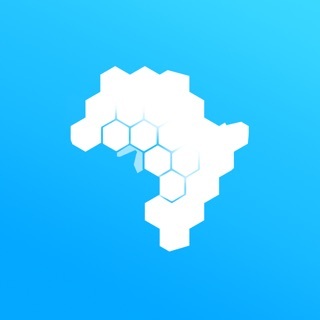 To get the most of this app you need to walk through the streets of one of the app's photographed cities.